What Are Half Moon Windows? A half moon window is a type of window that is semi-circular in shape resembling the crescent shape of the half moon. 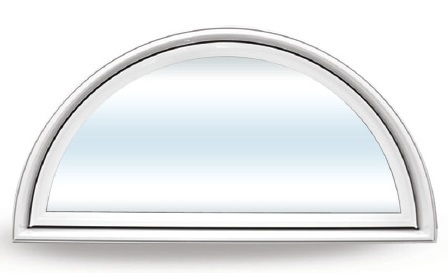 It is also called an eyebrow arch window. It only covers half of the window surface and while it can be made into a beautiful architectural window, it presents a decoration challenge to the home owners or building decorator. Half moon windows are often used in tall windows or on top of the front doors of homes and buildings. 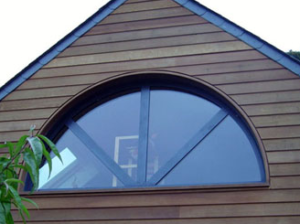 The main reason for choosing to install a half moon window is the beauty that is unique in its shape and style. Half moons are elegant looking and blend well with colored glass. It helps tint the sunlight that passes through the window, creating stunning shades inside the home. However, some would rather not have one because it is difficult to cover compared to other types of windows. To create a beautiful half moon window, it may take three or more days to handcraft the glass or create variations in colors and texture. Dressing a half moon window needs creativity and here are some ways that one can do to create an elegant window. Use a pleated shade to dress a half-moon window. This usually measures 48-inch and 72-inch sizes and placed in a plastic container looking like a large fan. Pleated shades made of paper are cheaper but can also be used but only for temporary use. A longer lasting pleated shade is made of fabric. A sunburst sheer will can be tailor-fitted for your window to scatter the light. It is made of plastic tubes curved according to the shape of the half-moon window’s opening. A curtain cord is inserted to hold the gathers of the material in the middle. A rose-shaped fabric is formed to cover the shape of the window. Customized the window blinds to fit the half moon window’s dimensions. Blinds made of wood or fiberboard is easy to configure into sunburst arch black-out arch or movable arch. Cover the half moon window using a cellular shade creating an arch. Two soft curtains can be tailor-fitted and attached to the window each on both ends. Enhance the regular stained glass by painting it to the window. Use a sketching pad and trace the design before painting the glass. When choosing a half moon window, consider that you will need to apply ways on how to cover it. There are two ways of doing so. You can either use window inserts and window films. Window inserts can be designed to cover the window completely. Use either wood or cardboard. This is easy to do. Simply measure the length of the bottom of the window and then measure the highest tip of the arch. Move these measurements in a piece of paper. Draw a straight line at the base and a dot at the top of the arch. Using a compass, draw curves to create a pattern of the window. Trace this onto the wood or cardboard and then cut precisely on the traced lines. You can use colored paper or wallpaper, or you can simply paint the cardboard or wood to decorate. Glue these to the window’s edges. The second choice is to cover the window with a vinyl film instead of wood or cardboard. Films stick more thoroughly to the window, and it is already available in different colors and designs. Prices of half moon window products differ according to type, color, size, and features. Thus, it is necessary to compare prices of various half moon window brands and to put products side by side in order to see the pros and cons. Therefore, the price of the end product you will get is dependent on your careful selection and inspection.